The stunning story of the breathtaking journey of nine extraordinary men from Budapest to the New World, what they experienced along their dangerous route, and how they changed America and the world. 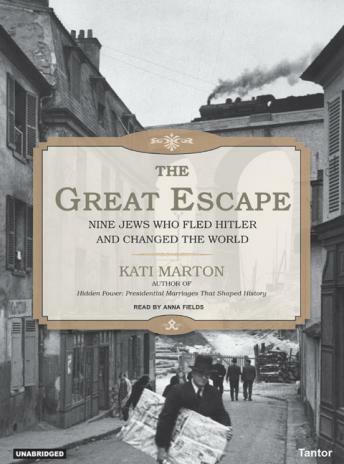 In a style both personal and historically groundbreaking, acclaimed author Kati Marton (herself born in Budapest) tells the tale of their youth in Budapest's Golden Age of the early twentieth century, their flight, and their lives of extraordinary accomplishment, danger, glamour, and poignancy. Marton follows these nine over the decades as they flee fascism and anti-Semitism, seek sanctuary in America and England, and set out to make their mark. The scientists Leo Szilard, Edward Teller, and Eugene Wigner enlist Albert Einstein to get Franklin Roosevelt to initiate the development of the atomic bomb. Along with John von Neuman, who pioneers the computer, they succeed in achieving that goal before Nazi Germany, ending the Second World War, and opening a new age. Arthur Koestler writes the most important anti-Communist novel of the century, Darkness at Noon. Robert Capa is the first photographer ashore on D-Day. He virtually invents photojournalism and gives us some of the century's most enduring records of modern warfare. Andre Kertesz pioneers modern photojournalism, and Alexander Korda, who makes propaganda films for Churchill, leaves the stark portrait of a post war Europe with The Third Man, as his fellow filmmaker, Michael Curtiz, leaves us the immortal Casablanca, a call to arms and the most famous romantic film of all time. Marton brings passion and breadth to these dramatic lives as they help invent the twentieth century. Boring, listen to to first 3 discs and couldn't get into it. sent them all back. i love history but the story was very dry and was not interesting. it bounced around lot and made it hard to keep track of what was going on with who.